To order Bronze Chief hard red wheat berries through our local co-op, click here to see our current order forms. We offer wheat berries locally very frequently, but not on every order form. If you’d like us to notify you when we take orders for wheat, sign up for our emails. We can also ship bulk Bronze Chief wheat berries directly to you. Visit our store to have your order shipped. What is Bronze Chief Hard Red Spring Wheat Good For? 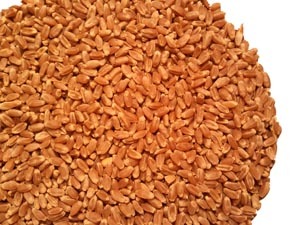 Hard red spring wheat is the quintessential grain of classic whole wheat bread; full flavored, wheaty and deep-colored. Hard red spring wheat is high in gluten, a protein that stretches to trap the air bubbles given off by yeast within the bread dough, so it is best suited for making yeast-leavened or sourdough breads. Bronze Chief hard red spring wheat is comparable to hard red winter wheat, however the winter wheat is preferred by many for growing wheat grass. We also noticed that the Bronze Chief hard red spring wheat berries are a little larger than the hard red winter wheat berries. Bronze Chief hard red spring wheat is available in 50 pound bags of whole grain wheat or as pre-milled flour, or in 45 pound sealed plastic food grade pails. Sealed pails will keep your grains fresh for a minimum of five years as long as the seal is unbroken. Once opened, pails of wheat must be stored in a cool, dry place and used within a year or so. In our experiments, bread made with Bronze Chief hard red spring wheat rose nice and high and stayed soft for several days. Here is a photo we took of breads we made with three different types of grain, Prairie Gold hard white wheat, spelt, and Bronze Chief hard red spring wheat. Our daughter made a video of the experiment below. Take a look – it’s pretty helpful!